He represented Illinois in Congress for almost eight years in the 1970s. But his international fame stems from the fact that for two years from 1932 to 1934, Ralph H. Metcalfe was considered to be the world's fastest human. He was born in Atlanta, Georgia on May 29, 1910. 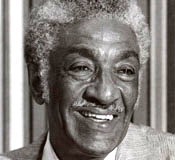 His family moved to Chicago when he was a small boy and he attended Chicago public schools including Wendell Phillips Junior High School and Tilden Tech High School at 4747 S. Union Avenue. At the 1932 Olympics in Los Angeles, Metcalfe won a bronze medal in in the 200 metre race. At the 1936 Olympics in Berlin, he won a Silver Medal in the 100 metre event running second to his American teammate and friend Jesse Owens. Much to the annoyance of Adolf Hitler who attended each day of the games, Ralph also ran with Owens in the 400 metre relay to win a team Gold Medal for the U.S. He is a member of the U.S. Track and Field Hall of Fame. Ralph received a Ph.B. degree from Marquette University in Wisconsin in 1936 and an M.A. degree in Physical Education from the University of Southern California in 1939. He was a track coach and political science instructor at various times at Xavier University in New Orleans from 1936 to 1942. He was a first lieutenant in the U.S. Army in World War II and received the Legion of Merit for program planning as a director of physical training. Ralph became a businessman in Chicago after the war. Gov. Adlai E. Stevenson appointed Ralph to serve as Illinois Athletic Commissioner from 1949 to 1952. Metcalfe was elected four times as Third Ward Alderman in the Chicago City Council from 1955 to 1969 and was president pro tem of the council. He was also founder of the Ralph Metcalfe Youth Foundation. Metcalfe was elected to Congress as a Democrat in 1970 replacing the late Bill Dawson. He represented Illinois from January 1971 until his sudden death on Oct. 10, 1978 in Chicago. He was married to Madalynne Fay Young and had one son, Ralph, Jr. Ralph was a long-time member of Corpus Christie Roman Catholic Church and he is buried at the Holy Sepulchre Cemetery in Worth, Illinois. In 1991, the Ralph H. Metcalfe Federal Building at 77 W. Jackson in Chicago was named in honor of Ralph.